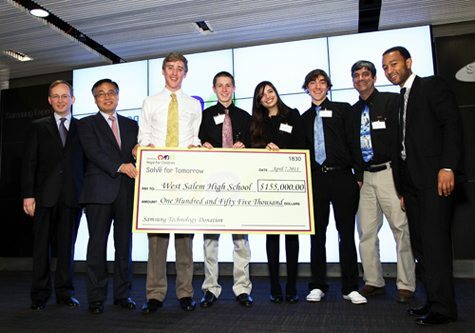 Samsung Electronics North Americas CEO YK Kim and EVP David Steel are pictured with Grammy winner John Legend and the Grand Prize winners from West Salem High School, Salem, Oregon. During the last six months, more than 1,100 schools from across the country have competed for $1 million in technology from Samsung and its partners Microsoft, DirecTV and the Adobe Foundation through the Samsung Solve for Tomorrow Contest. Solve for Tomorrow aims to increase student interest in science, technology, engineering and math (STEM). As the grand prize winner, West Salem High School will choose from a range of technology prizes including projectors, smart boards, LED TVs, printers, laptops and software. The total grand prize package is valued at $155,000. The schools use of technology, innovative thinking, and creativity were key factors in setting it apart from the other schools, which was recognized by both a public voting panel and Samsungs panel of judges which included representatives from Samsung, Microsoft, the Adobe Foundation, the National Environmental Education Foundation, Communities in Schools, Great Schools, TWICE Magazine, USA Today Education, and Change the Equation.